The Flour Mill condos in Georgetown may not be actual antiques, but they are certainly inspired by history. Located at 1015 33rd Street NW, between K Street and the C&O Canal, these luxury residences are named after actual mills that existed in the neighborhood more than 200 years ago. Yes, there were several flour mills along the Potomac River waterfront, along with textile mills, a paper factory, tobacco warehouses and coal yards. In fact, our subject condominium does not stand alone in its homage to past Georgetown industries. The Paper Mill is another example of luxury condos for sale that offer a nod to the past. But let’s not get too sidetracked by trivia. 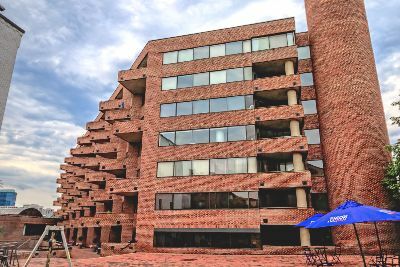 The eight-story Flour Mill complex was built in 1985, offering an interesting brick exterior design that features terraces set at angles, resulting in a ripple effect. There are 59 upscale residences here with unusually spacious floor plans, running from 1,018 to 2,281 square feet. There have been a number of updates since the condominium was first delivered. The layouts are fairly traditional, albeit with open living areas. Also worth noting are the contemporary kitchens, thick crown molding and the aforementioned private terraces which are quite large. Plus, units with rear facings overlook the historic canal while front units have terrific Potomac views. Recent listings have been ranged from the mid-six figures to around $1.35 million. Residents here enjoy a staffed front lobby and concierge service, and garage parking (the latter for an additional fee). It’s not a place with ton of amenities—no pool or fitness center—but the prime Georgetown location makes up for that. The Flour Mill condos are close to top shops and restaurants, the Waterfront Park and the Foggy Bottom Metro Station.